So says Marian Masoliver, co-founder and co-director of The Actors Space, which she runs with her partner in life and work, Simon Edwards, speaking in summer 2018 as the centre celebrated 20 years in operation. The two met at the Lecoq school in Paris. 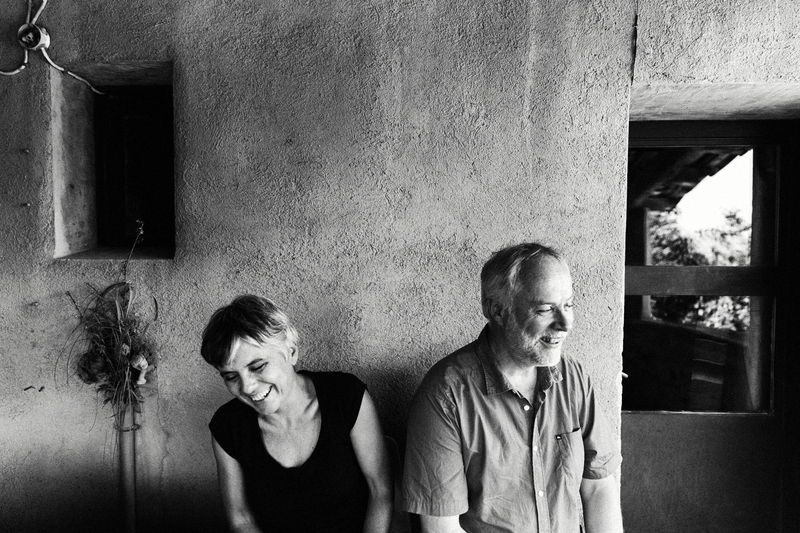 After graduating, they both – separately and together – performed, directed, taught, and toured (with companies such as La Fura del Baus and Kneehigh) before deciding to set up a residential summer school in a beautiful old farmhouse in the hills of Catalunya, in the tiny hamlet, close to the Roman town of Vic, where Marian’s family had lived for many generations. 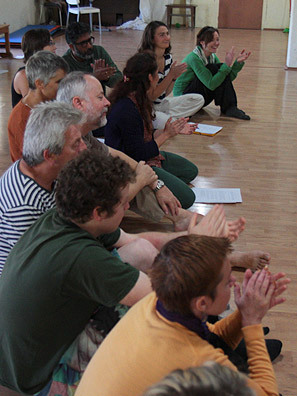 And so, for every year of the past two decades, they have welcomed students of all ages and experiences, from all corners of the globe, to participate in their unique actor-centred programmes. 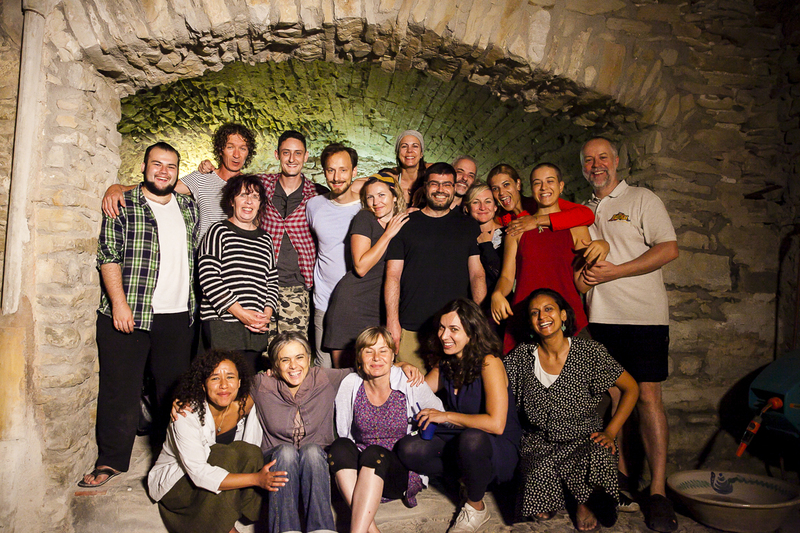 ‘In a typical workshop of eighteen people, there might be people from across Europe, India, Russia, the USA, Australia the Middle East… It is very interesting as a teacher to see how they all work together – beautiful to see that, and the different ways people approach theatre,’ says Marian. This internationalist approach is key to both of their beliefs. 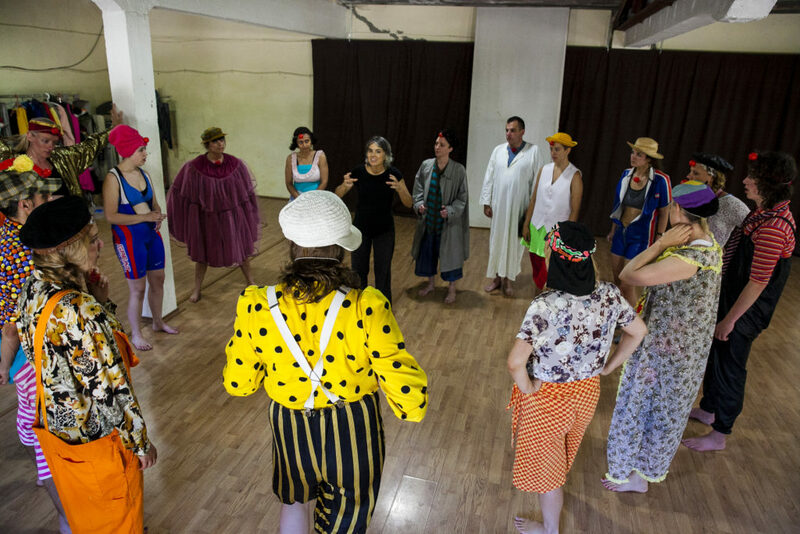 In life – as in theatre – international collaboration, harmony, resolving difference, and learning to live together are essential, to combat and contradict what Simon calls ‘the strange distorted mirror of modern media’. In a world in which the US presidency has turned itself into a sickening reality TV show; the Spanish government have cast themselves as bullies, taking agency away from the people of Catalunya; and the Brexit obsessed UK parliament has descended into a pantomime, political life today has moved beyond anything we could satirise as they are all doing it so well at it themselves. What on earth, then, can we do? ‘Celebrate the things that unite rather than divide,’ says Simon. ‘The things that divide us change – they aren’t fixed – but the things that unite us are the same. We always gravitate towards peace.’ He talks of ‘sweet banality – the fruits of gratitude, joy, affection’. If you visit The Actors Space, the peaceful and communal ethos of the place becomes abundantly clear from the start. Yes, the work in the studio is important – it’s what has brought us here – but there is so much more. There’s the shared meals – home-cooked, using local produce as much as possible – taken around long wooden tables. There are the evenings after dinner, sitting and talking, or watching the bats and owls fly over the tree tops. There are the morning walks, through beautiful countryside, and the opportunity to swim in the pool, or just sit in the sun and read or write. There’s something very special about a residency in such a lovely environment, and the people you are with for the week become everything – family, friends, work colleagues. A tight-knit international community. How the Actors Space operates, and what the work entails, has, Marian says, ‘developed organically’. It has grown from their training with Jacques Lecoq (who never espoused the notion of a ‘method’ in any case) to developing their own way of teaching, based on the observation of life, influenced by the work they have done around the world, and by their growing interest in film-making, both drama and documentary. Both speak of the need to continuously grow, change and develop as a teacher; to learn from your students and from the world. ‘In Iran, running a clown workshop, I learnt how much people valued coming together to tell stories, making each other laugh, blowing off steam – they influenced me deeply,’ says Simon. ‘As soon as there is a method, you’ve killed it,’ says Marian. ‘Killed the baby. Put it in a box. I teach in other places, and I am always researching.’ Tout bouge, as Monsieur Lecoq might say (and indeed, often did). 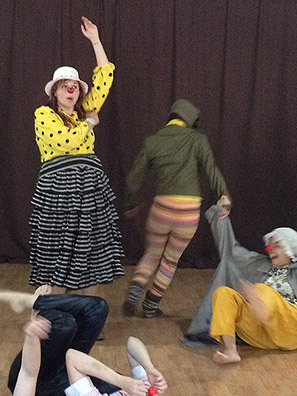 So, having started firmly wedded to the physical theatre work learnt with Lecoq – embracing movement theatre, mime, mask and clown – Simon and Marian have, whilst always honouring those roots and core practices – moved into very many other ways of working. They spend part of their year working on film projects, which have recently included some extraordinary documentary work with child soldiers in Colombia; and they have also worked in Ecuador creating radio pieces built around gang-leaders’ stories. Truth and reconciliation, and the part that theatre could play in those process (akin in some ways to the work of Augusto Boal) is a growing interest – and may at some point find its way into more of their work. ‘Even a small amount of expression of truth has power,’ says Simon – talking of their time in Ecuador and Colombia, but it applies equally to all the work they do. It is vital not to be cowed by oppression and injustice; to resist the tyrants and the bullies; to see that justice wants to be seen to be done, and that this is the natural human order. Collective hope is important, to counter the feelings people (worldwide) have of being isolated or abandoned. Theatre, they believe, is a healing force, bringing people together – be it 8 or 800 people. Inspired by these sentiments, Simon and Marian have also, in recent years, become involved with a local Carnival organisation in the small Catalonian town of Mollet (near Barcelona) – an opportunity for community celebration, and to laugh together at the ridiculousness of human behaviour. Wherever, whatever: ‘We need to hear stories,’ says Marian. ‘Who are we? What are the choices?’ These questions are paramount – and universal. 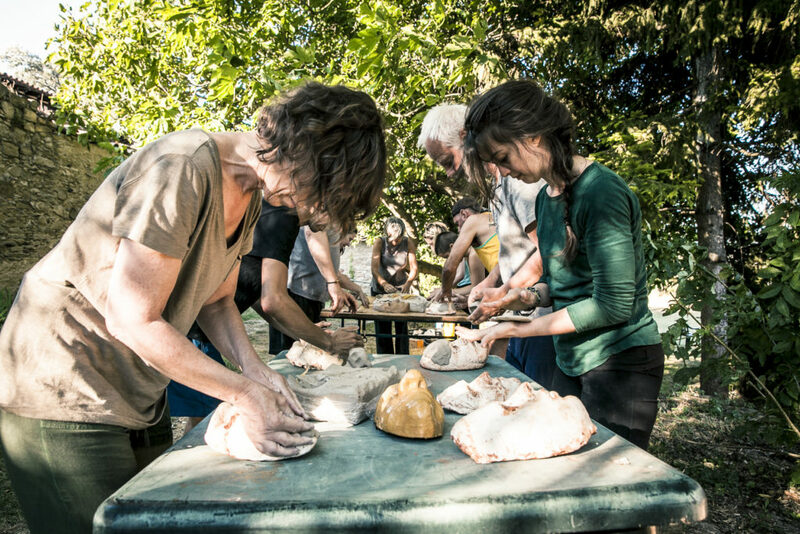 The work they both do year-round, outside of The Actors Space, informs what they bring to the residencies there. As does their personal experiences – as a couple, as parents, as members of their local community (the centre is their year-round home). Meanwhile, the summer residencies at the school – influenced by all of the couple’s interests and skills – have grown to include acting to camera, directing for film and theatre, and dramatic scriptwriting workshops. These workshops have joined The Art of Comedy, which takes the student on a fabulous journey from full mask to red nose to creating comic sketches on-camera (written about by Total Theatre here); and The Creative Actor, which brings together Lecoq influenced physicality with a development of the complete actor, voice and all. It is what’s needed in these difficult times – although both are keen to emphasise that ‘writing’ takes many forms in theatre. For example, in the classic Lecoq exercise on the archetypal cardinal sins, when the mask of Pride meets the mask of Jealousy, what happens? There may be no words involved, but the encounter in the performance space is content – it is writing that is written on the body. And (to stay with the filmmaking Ten Commandments): Content is King. With the acknowledgement of the importance of all three elements in this triangle came the development of first the Directing Performance course, and later the Dramatic Writing course which saw its first outing in 2018. In the Directing Performance course, participants learn how to direct actors by giving them freedom within a clear structure, guiding them to create their best work. Participants explore the fundamentals of theatre and film directing, and learn to devise scenes and work up scripts. They also experience what it is like to be directed – the creative triangle can be separated into three distinct roles, but it is good for everyone to have at least some experience of all three! The Dramatic Writing course (which grew out of the Directing course, just as the Directing course grew out of the Creative Actor) was built on a similar principle of embracing a ‘total’ experience. Yes, there is writing involved – lots of it, with scripts being revised and brought from page to stage daily. But everyone also takes part in the physical theatre warm-ups and workshops, exploring the principles of play, the body in space, and the push/pull essence of dramatic conflict. The acting and devising processes employed inform the writing, and vice versa. Regardless of which workshop they are enrolled on, the crucial thing for participants is, as Simon puts it, for them ‘to really explore what they are interested in, to trust their life experiences’. He talks of the theatre process as being like a sophisticated extension of child’s play. Explore the conflicts, find the resolutions. ‘Entertainment is important,’ says Simon, ‘Fun is underestimated. But we don’t want to just indulge, or be frivolous. We want to find the poetic depths – our common humanity…’ And later, he says: ‘It is not about making change, it is about sharing truth.’ Speak your truth, write your truth, act your truth. To be at the Actors Space is truly a gift – a way to give yourself the time and space for artistic renewal. Images by Janneke Aalbers and Natasha Elmir. The Actors Space provide high quality training for actors, directors, writers, teachers and students of dramatic art. Dorothy Max Prior attended the inaugural Dramatic Writing residency at The Actors Space in July 2018 as a guest of the centre. She has previously taken part in The Art of Comedy, Bouffon, and The Nomadic Fool residencies at The Actors Space, all previously written about for Total Theatre Magazine; and has led the Dance Yourself Stupid Eccentric and Comic Dance workshop there. For full details and to book see The Actors Space website. This entry was posted in Acting Courses, Acting Workshops, Blog, Clowning, Directing, Improvisation, Lecoq training, Mask Theatre, Theatre, Theatre and Film and tagged lecoq training, Marian Masoliver, simon edwards, The Actors Space on April 9, 2019 by Actors Space.